Bloody hell that was good! Winner of the 2018 British Composer Awards, The Harmonic Canon is a project like no other. 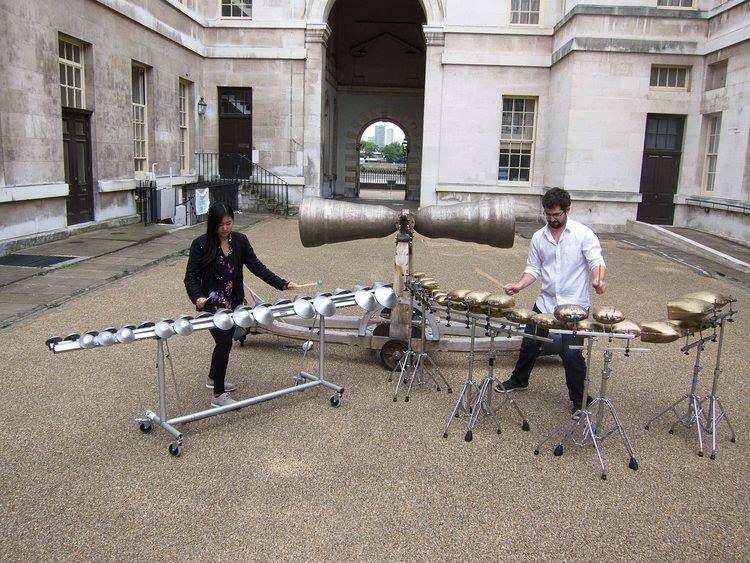 Featuring a specifically designed half-tonne double bell, an array of rare and distinctive percussion and two highly virtuosic, international percussionists, composer Dominic Murcott has written a work that is as much a visual spectacle as it is music. From high energy, gamelan-inspired intricate rhythms, to meditative, continuously shifting and evolving tones, The Harmonic Canon explores the distinctive sound world of the computer designed double bell of the same name. This unique double bell was created by sculptor and jazz bassist Marcus Vergette, based in Hatherliegh, near Okehampton. The bells are joined and mounted in a frame which allows them to be rotated by the musicians, while being played. It’s an amazing thing to witness and hear (and do – see wokshops). The piece explores the unique sonic identity of the bell in two 21-minute movements, with Part I exploring the metallic resonance of the bell, and Part II looking at the unique range of the bell’s harmonic frequencies. Both movements are augmented by an array of metal instruments that, working together with the bell, create a unique identity that can be enjoyed by both casual listeners and new music specialists alike. The Harmonic Canon will be released by the east London new music label nonclassical in May 2019 on 12” vinyl, digital download and streaming services. Previously, it has been performed at Huddersfield Contemporary Music Festival and has received airtime on BBC Radio 3. Completing the programme is a new work by emerging composer Heather Stephenson that – in stark contrast to the rest of the programme – explores the intimate acoustic and textual possibilities of wooden instruments that are small enough to fit inside a small bag. Admission £15 or £10 or £6 – you choose!